BoxOffice® — New Boxoffice Weekly on the iPad: Multiple Marilyns, Mucho Michael Fassbender, and the Rebirth of "Shhhhh!" New Boxoffice Weekly on the iPad: Multiple Marilyns, Mucho Michael Fassbender, and the Rebirth of "Shhhhh!" Get ready for awards season with our special indie edition of Boxoffice Weekly. 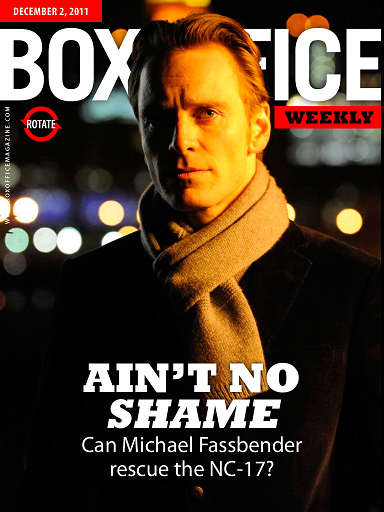 Michael Fassbender—the It Boy of 2011—stars in his fourth film of the year, the daring NC-17 drama Shame. Inside, Shame co-star Carey Mulligan opens up about making a film that's painfully, nakedly honest about the way people use each other to feel complete, and we go on the scene to see how the film is trying to win fans during awards season despite its rating. Look back at Fassbender's short but mighty career as we rank his six most seductive roles, and then look ahead as editors Amy Nicholson and Phil Contrino debate over whose career track Fassbender will follow: Gary Oldman or Marlon Brando? Also making noise is the black and while silent The Artist, on the fast track to a Best Picture Oscar nomination after winning over Cannes and the New York Film Critics Circle. Can a '30s throwback charm a 21st century audience? 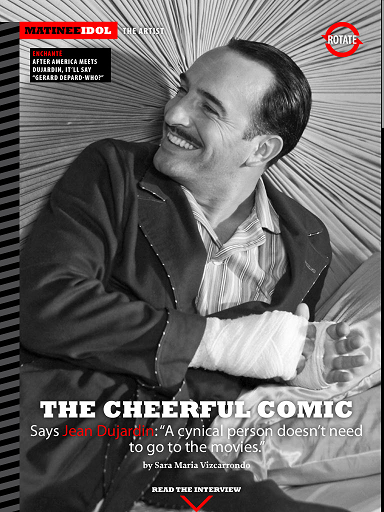 We talk to three people who argue yes: The Artist director Michel Hazanavicius, its suave French star Jean Dujardin, and two girls who know a good silent when they see it: Charlie Chaplin's granddaughters Dolores and Carmen. 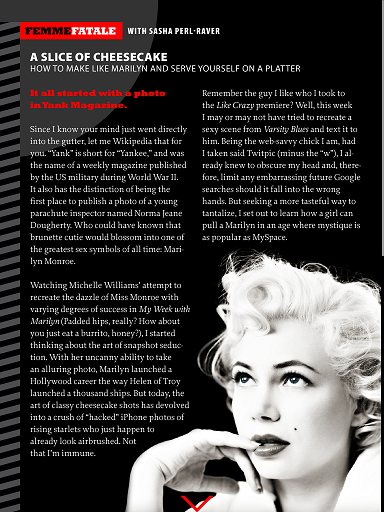 Then Marilyn Monroe storms the magazine with the new flick My Week With Marilyn, about the clashing of the titans when the blonde bombshell flew to England to shoot a film with theater legend Sir Laurence Olivier. Get the scoop on the real life movie-within-a-movie with our touchable trivia poster for The Prince and the Showgirl, and strip off with Sasha Perl-Raver as she cribs notes from Monroe on how to take the perfect cheesecake photo (and we don't mean edible—or wait, maybe we do). What other Marilyn biopics should be made? We pick six and the actresses who should star in them from Jennifer Lawrence as a newly married Norma Jeane to a catty buddy comedy about Marilyn and Truman Capote starring Scarlett Johansson and...Thora Birch in prosthetics? Page on as a modernist puppeteer tells us what he learned from The Muppets, Ross Lincoln fights female objectification by posing in the buff, Dr. Alonso Duralde gives his Final Grade to Arthur Christmas, brainy film stars Sigmund Freud and Sherlock Holmes battle head-to-head in Cage Match, and Steve Martin gets his best Tweets showcased in Last Laugh. Too cold to go outside? We bring a full retro night at the movies to you with a newsreel + a cartoon + a serial + the 1941 Cary Grant and Irene Dunne classic Penny Serenade. Plus, reviews of every movie opening this week in theaters and a tour of our patented box office prediction data, The Pulse. 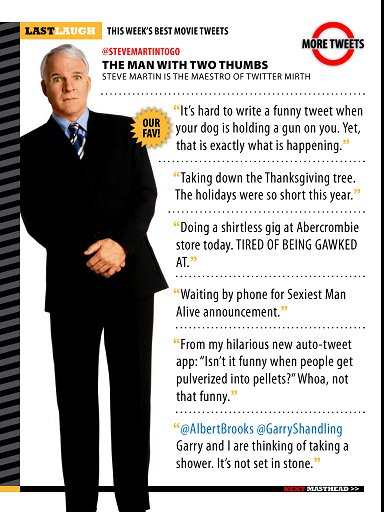 Click here to check out what's inside.